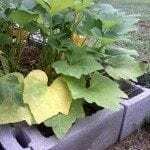 My yellow crookneck squash plants are beautiful and deep green (stems and leaves). After a bud opens into a nice bloom, they fall off and there is no fruit. The blooms simply wilt normally (I think) with no appearance of any rot. Any ideas? Thanks.